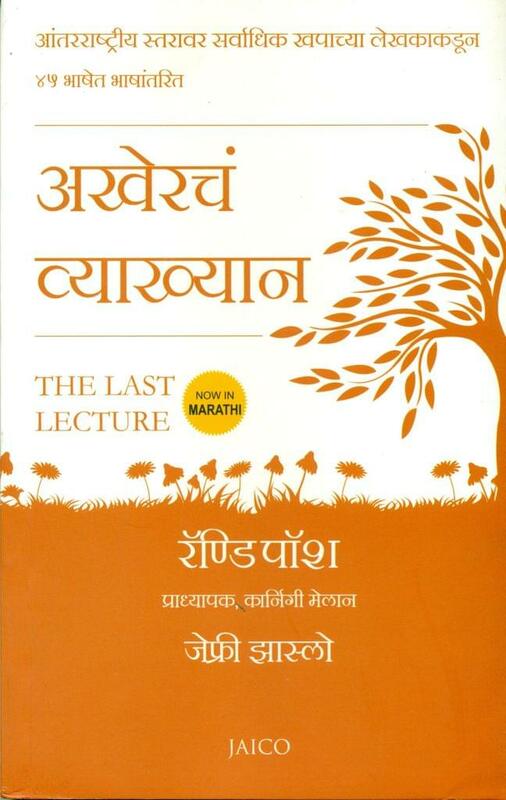 International Bestseller - Now in Marathi, a lot of professors give talks titles titled the Lat Lecture. Professors are asked to consider their demise and to ruminate on what matters most to them and while they speak, audiences can't help but mull the same question: What wisdom would we impart to the world if we knew it was our last chance? If we had to vanish tomorrow, what would we want as our legacy? When Randy Pausch, a computer science professor at Carnegie Mellon, was asked to give such a lecture, he didn't have to imagine it as his last, science he had recently been diagnosed with terminal cancer. But the lecture he gave "Really Achieving Your Childhood Dreams" wasn't about dying. It was about the importance of overcoming obstacles, of enabling the dreams of others, of seizing every moment (because "time is all you have and you may find one day that you have less than you think"). It was a summation of everything Randy had come to believe. It was about living. In this book, Randy Pausch has combined the humor, inspiration and intelligence that made his lecture such a phenomenon and given it an indelible form. It is a book that will be shared for generations to come.